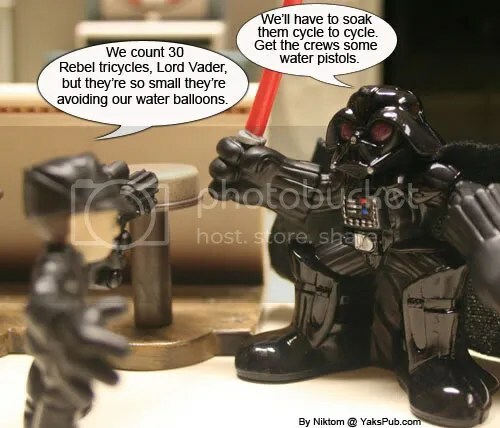 Even as a kid Vader was quite the strategist! Aren’t the Galactic Heroes too young to be in the Pub? Yes… yes they are. Good thing they have really good fake I.D.s. Of course when your Vader Jr….. who’s gonna try to kick you out? niktom yo are a genius. the galactic hunters using fake I.D.s to get in the pub awsom! I really like this one, Nik’. I usually don’t like the galactic hero ones, but this one is really clever. Good job. Thanks man, and thanks for the B-day wishes the other day. Hey they could just be Mid…..errrr Little People!! No problem, Nik’. Any time.